AutoForm-ThermoSolver, from AutoForm Engineering Gmbh, Zurich, Switzerland (Troy, MI), enables users to simulate the hot forming and quenching processes. The software takes into account heat flux and phase transformation during quenching. In addition, it allows for the graphical display of the final part properties, such as thickness distribution and strain-stress distribution, as well as the final part properties which are characteristic of the hot forming and quenching processes, such as hardness distribution and martensite-content distribution. The software provides engineers with improved insight into the structural transformation of material. The supported tailored-tempering process allows for the engineering of stamped parts with targeted local strength properties. Based on the results of AutoForm-ThermoSolver, crash-simulation accuracy can be improved by taking the real strength distribution of the hot-formed component into account. 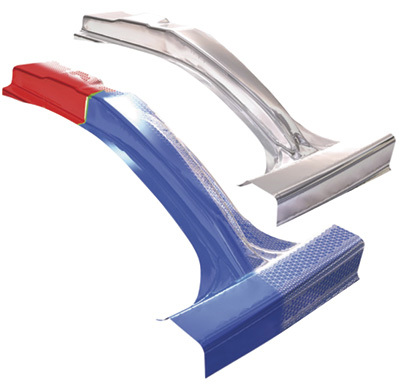 With AutoForm-ThermoSolver, car manufacturers and suppliers can reliably design and engineer the processes of hot-stamped parts for their new vehicles, such as A- and B-pillars, tunnels, front and rear bumper beams, side-rail members, door beams and roof rails.